Principal Cast : Wil Wheaton, Corey Feldman, River Phoenix, Jerry O’Connell, Kiefer Sutherland, John Cusak, Casey Seimaszko, Richard Dreyfuss. Synopsis: Four young boys trek across the county to find the body of a young lad killed by a train. Based on the Steven king short story The Body. What we think : Terrific coming-of-age yarn from Stephen King translates into superbly realised adaptation from Rob Reiner, featuring stand-out performances from the four main leads, and remains to date one of the best film versions of a King story ever. You remember that Bryan Adams song, Summer of ’69? The fond remembrance of your childhood, the rose-coloured tint of historical inaccuracy seeping into the memories of your youth? Friends you had, and lost? Before, of course, finding them again on Facebook? Imagine a movie that could take you back to your childhood, a cinematic time-machine able to transport you into a time when your parents were your whole world, your friends were your true family, and the dust and angst of formative years still hung thick in the air. Stand By Me is just that movie. Stephen King’s non-horror works often make the best translation to screen, as we’ve seen in The Shawshank Redemption, The Green Mile and even The Mist (which is borderline horror, more a great character study); they all rank as some of the better adaptations of the masters works. 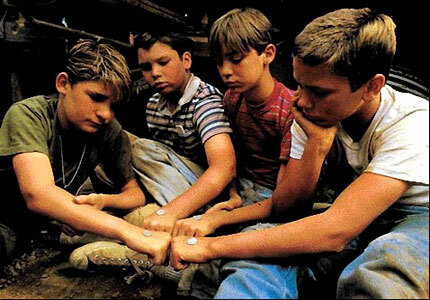 But prior to all those, Stand By Me, released in 1986, remains the classic coming-of-age story it was upon release. Cool.. we’ve got…. forty cents. 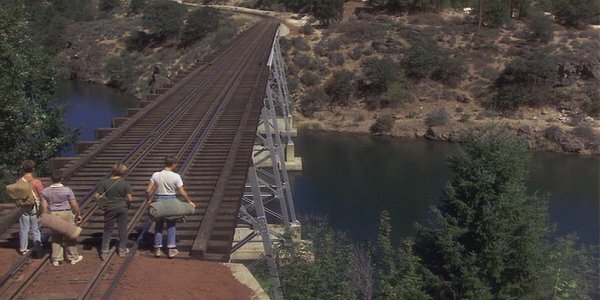 Stand By Me tells the story of four friends, Gordy (Wheaton), Chris (River Phoenix, Teddy (Corey Feldman) and Vern (Jerry O’Connell), who discover the existence of a dead boy along a railway line in a distant part of the county. They decide to trek out to find this body, a kind of rite-of-passage through childhood, if you will. So of they go, encountering various obstacles and adventures along the way, including a murky pond full of leeches, a junk-yard dealer with the worlds most vicious dog, and a train bridge crossing that could see them all killed. 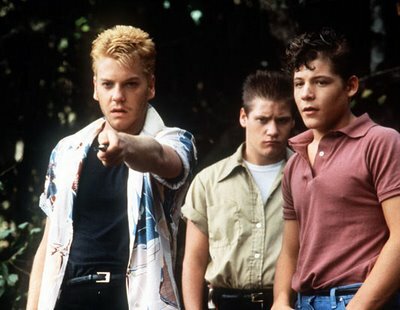 They’re also up against some of the town’s older boys, a gang of louts led by “Ace” Merril (Kiefer Sutherland), who also hope to uncover the body to become famous. In 1959 Small Town USA, a dead body means Big News. Stand By Me isn’t a film about the journey, rather, it’s a film about characters. Each of the four young leads has his own unique character arc, and director Rob Reiner deftly allows each to shine through at key moments of the film. These boys aren’t heroes, they aren’t particularity brave or weird; they’re boys, and they do things boys do. Gordy is the thin, lanky one, whose elder brother has recently been killed leaving his parents beset with grief. Gordy’s father seems to detest the existence of his surviving son, at the expense of the elder, since Gordy hangs out with a group of losers. Gordy’s mother barely registers thought about much at all. Chris, son of a violent alcoholic who abuses him constantly, is perceived by the town as a criminal, regardless of the fact that he may be innocent of what he’s accused. This constant negativity wears Chris down, so much so that he sees in Gordy his personal salvation: Chris takes it upon himself to see that the vulnerable and sensitive Gordy is protected somewhat from the tragedy and iniquities of life. Teddy, the bespectacled obsessive compulsive one, had his ear burned badly by his violent father, before his father ended up in a mental institution. Teddy has since become obsessed with his father, a supposed war hero who landed on the beaches of D-Day during the war. While the town thinks Teddy’s father (and to a lesser degree Teddy himself) is a loony, anybody mentioning it to Teddy himself will become the target of unsuppressed rage. And Vern, the overweight nerd of the group, is the younger brother of one of Ace’s gang hoodlums, and the catalyst for the events of the film. Vern isn’t socially… normal, if you will, and is probably the most innocent and childlike of all the character in the film. For the last time, I’m not the guy from My Secret Identity! Oh, wait. I am. Sorry. There’s an elegant simplicity to Stand By Me that still resonates with the modern viewer. The story isn’t action packed, nor is it overly violent (except where required), rather, the intent is to go on a personal journey with four characters going on an actual journey… The characters are the key, not the travels they take. Gordy’s self worth, Chris’s acceptance of his family lot and the fact he’ll never be able to get away from his reputation, Teddy’s inability to act normally, and Vern’s lack of intellect all make for interesting and often combustible narrative plot points, and Reiner has the sure hand of a director able to capture the outcome. All four main leads are, for want of a better word, outstanding. Wheaton, who would go on to fortune and infamy as Wesley Crusher on the Star Trek Next Generation series, is the film’s main character, told in flashback by narrator Richard Dreyfuss. Gordy is central to the film, his character the one with the most growth and depth. River Phoenix acts his socks off at times, the young boy showing a performance beyond his years, and it truly is one of Hollywood’s great tragedies that he left us too soon. Eternal Brat Corey Feldman, whose roles in Gremlins and The Goonies gave him screen experience, is wonderfully off-kilter here, as the slightly disturbed young boy who constantly narrates his own army-style antics. Feldman does what I consider to be his best work here, as opposed to the more family oriented Goonies, as this film allows a more adult, more natural sensibility. And Jerry O’Connell is simply hilarious as the films comedy relief, Vern. Vern isn’t all that bright, but he’s a devoted friend and ally, even if he is the clichéd “fat friend” everybody has at one point or another. As mentioned, Stand By Me is recounted as a flashback, with the Writer (Dreyfuss) coming back to Castle Rock upon the death of one of his friends. His reflections of his childhood form the basis for the movie, and he allows us to take from that what we will. While the narrative deals largely with death and our reaction to it, the film isn’t melancholy or depressing: rather, the young boys take this journey as an affirmation of life, in a way. Reiner doesn’t dwell on the death in the film too much, although it’s alluded to constantly by dialogue and some flashbacks. A laconic film, Reiner allows each character moments to shine, to engage us with their unique experiences and, in a way, allow us a tangible link to our own childhoods of innocence. Stand By Me also contains a wonderful soundtrack, a lot like Forrest Gump, a melodic way of transporting you to a point in time without having to have subtitles to say so. Ben E King’s iconic song, of the same title, plays over the end credits, a perfectly exquisite way of transitioning from the film back into reality. Get off my plane. No, wait: get off my lawn… nahh, look, just go away will ya? Having watched this film quite recently, I was quite impressed with just how well it holds up today. It remains a great film, not for any special effects or even any particularly good acting (although the acting is good), but rather for the identifiable themes the film holds. It’s a coming-of-age film, a film about losing ones innocence and how you eventually drift from those precious memories by the vast ocean of time. The themes in the film still resonate with people today, and probably always will. You may not have born in the 50’s, or grew up in the 60’s, or even lived in the USA, but Stand By Me transcends the time and place to become an analogy for all of us; it’s a wonderful film that deserves a place in any collection of wonderful films. © 2010 – 2018, Rodney Twelftree. All rights reserved. 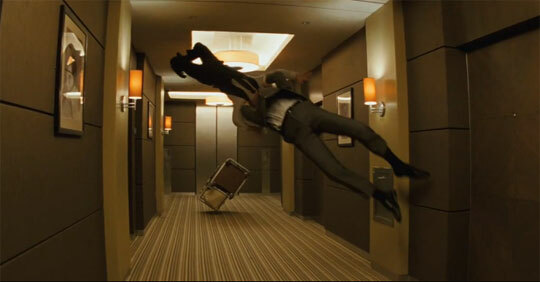 Sucker Punch Trailer here now….